I originally stumbled upon a recipe for a rice salad with roasted vegetables years ago, and made it for some party or other at our house. I’ve long since lost that recipe and any idea of where it came from, but over the years I’ve made it in various permutations. This is a simple one, but a good one. Cook the rice according to directions. While the rice is cooking, preheat the oven to 400 degrees. Place the carrots and parsnips in the center of a large sheet of aluminum foil; drizzle with olive oil and seal the package tightly. Put the parcel on a baking sheet and roast at 400 degrees for 20-25 minutes, until fork-tender. In a blender, combine the garlic, thyme, mustard, vinegar, and honey until smooth. Stream in the olive oil with the blender running, then add the salt and pepper and taste. Adjust for seasoning if necessary. 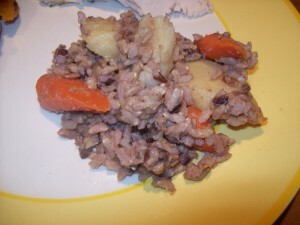 Combine the cooked rice and vegetables in a large bowl. Pour the dressing over the top and toss until thoroughly combined. Serve warm.